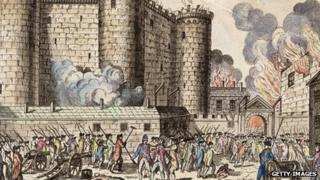 When the French parade on Sunday for their national day they will be marking the fall of the Bastille prison-fortress on 14 July 1789. Everyone knows that. Or do they? In fact there is a surprising twist in the story of this proud Republican anniversary. Without realising it, what the French may technically be celebrating is not the storming of the Bastille but an event that took place exactly one year later, on 14 July 1790: the Fete de la Federation. To explain how this came about requires a small detour into French history. It is easy to forget that for the first century after 1789, France lived mainly under the kind of monarchical regimes the revolution was supposed to have done away with. There was Napoleon; then the restored Bourbons after Waterloo; then King Louis-Philippe; a brief republican interlude starting in 1848; and then the second empire under Napoleon III. Not until 1870, after defeat in the Franco-Prussian war, did France establish a lasting republican system. And even then, in the Third Republic's first elected Assembly, there was a clear majority of members who actually favoured a return to monarchy. The forces of anti-revolutionary conservatism remained strong. By the end of the 1870s, the situation had moved. Most monarchists had become reconciled to the Republic; there was a Republican majority in the Assembly; so now was the time to anchor the new order with a set of national symbols. And one of the first questions was the choice of national day. After looking at various options, the left settled on 14 July. They reasoned that the taking of the Bastille was what triggered the French Revolution - the moment an angry people began to throw off its chains. But the trouble was that 14 July was also a day of bloodshed. The governor of Paris had his head cut off with a pen-knife. For the ex-monarchists - now late converts to the Republic - this was all too much. A national day should be a day of reconciliation, they argued, not a celebration of class hatred. And so eyes turned to the Fete de la Federation. A year after the fall of the Bastille, Paris had been a city of hope. King Louis XVI was still on his throne, but his powers were being circumscribed by a constituent assembly. The privileges of the aristocracy had been abolished. It was what historians have dubbed the "optimistic phase" of the revolution. And to mark it, the authorities organised an extraordinary outdoor event on the Champs de Mars - where the Eiffel Tower now stands. A 24m (80ft) triumphal arch was erected, and banks of wooden seating for the 400,000-strong crowd. In the centre was set an "Altar of the Fatherland", inscribed with the sacred words "The Nation, the Law, the King". In the weeks preceding, Parisians of every description had joined in the task of preparing the site - duchesses mingling with flower-sellers. It was - according to the historian Simon Schama in his book Citizens - "a great festival of mankind morally purified by their communal labour". On 14 July 1790, it poured with rain. But delegations of the newly-created national guard from across France paraded through the city, led by the Marquis de Lafayette. On the Champ de Mars there was military music; oaths were made to the King, who in turn swore to uphold the decrees of the National Assembly; Mass was celebrated. And in a scene straight out of today's celebrity culture, there was a roar of excitement as Queen Marie-Antoinette held up the baby dauphin - heir to the throne - to the crowd. In the words of historian Georges-Henri Soutou, it was a moment when "it was still possible to imagine that a new regime could be established - one that did not offend the religious sensitivities of the majority and had the support of the King". It did not last, of course. Within a year, the revolution was on course towards its bloody conclusion. But a century later, the Fete de la Federation had the huge distinction of being an occasion on which just about everyone - from Bourbon loyalists to proto-Socialists - could agree. For the Senator Henri Martin - who drew up the National Day law - "14 July 1790 is the most beautiful day in the history of France, possibly in the history of mankind. It was on that day that national unity was finally accomplished." Passed in 1880, the law was deliberately ambiguous. It did not say which 14 July was being celebrated. And today, of course, everyone thinks of it as Bastille Day. But spare a thought for that other Quatorze Juillet - when France seemed on the verge of more peaceful, gradual change. It is part of the story too.